If you find yourself asking, ‘What should I do with my life?’ and coming up blank, don’t fret. Follow our step-by-step process to finding your purpose, defining your core values and choosing your next step. With these easy, structured exercises, you’ll get started on designing an intentional life. To help you work through these questions, here’s a free printable worksheet that you can pin up to keep you on track. What have humans ever done with their lives, anyway? Everyone gets stuck sometimes. You’re not alone. How to answer the question: what should I do with my life? True stories from people who found their path. We’ve all asked it… maybe a few times. Sure, some remarkable people graduate early from high school, get a PhD and start three companies by the time they’re 23. They’re the ones you tend to hear about. But they’re remarkable mostly in that they are so rare. Some people waste a bunch of time trying to find their feet, spend a few year goofing around after high school, only to find themselves working in a mediocre job six years later. Some people wake up one day, aged 40 (or 50, or 60, or 70) and discover they’ve been going through the motions. What happened to the life they were going to stumble across one day? Are these two different sub-species of human, you might ask? How can two people, with similar starting conditions, grow in such different directions? It must be genetic. You were designed for playing Skyrim, and someone else was designed to do all the fancy stuff. You just didn’t get the gene for ‘drive’ or ‘passion’. I want to throw something else at you: the difference is a sense of purpose. And it’s not something you’re born with or without. It doesn’t come from someone else, or from the outside world. It’s something that you get to decide for yourself when you answer the question: What should I do with my life? Okay, sure. But that’s one hell of a question. Haven’t humans been asking this since the beginning of time? 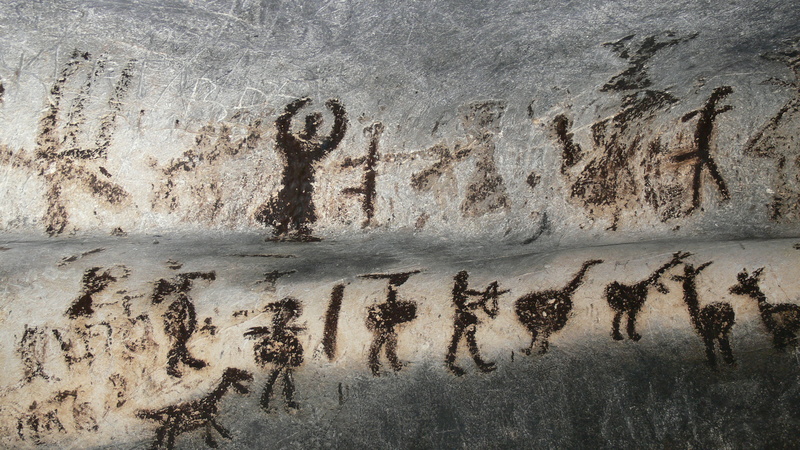 This cave painting may be about what the artist should do with their life, but let’s be real: it’s probably about hunting, or gathering food. What have humans ever ‘done with their lives’? A classic painting about ‘being an individual with a special purpose’ from the Romantic Movement. We don’t have any hard proof on this. Notoriously little evidence of what early humans actually thought has survived the ravages of time – historians have to base their guesses on clay pots and the like. But if you look at the world we live in today versus, say, the one humans lived in 500 years ago, it doesn’t seem likely that ‘What should I do with my life?’ was a burning question for ye olde folk. Why? 500 years ago, your place in society was pretty much locked in. If you were born the child of a wealthy merchant, the odds were you’d grow up to be a wealthy merchant too. If you were born into a family of corn farmers, you’d grow up to be a corn farmer. The idea that we can be anything we want, and that each person has a unique purpose? It’s a pretty new idea. It has roots in a movement called Romanticism from the late 18th and early 19th century. Let’s not go into detail about it here, but suffice to say it’s has had a huge impact on modern culture. Among other things, Romanticism championed the idea of a ‘true self’, or authenticity and sincerity. As a consequence, soul-searching became the new thing to do. Accepting your lot and your place in life were off the table. The legacy of Romanticism is still going strong. And now, for us living in today’s society, the question is definitely burning. The number of Google searches conducted every month for ‘What should I do with my life?’ is over 2300 per month in the UK alone. It’s one of the hardest questions to answer. If you’re struggling to answer it, you’re not alone. The problem with this question is it’s so open-ended. Also, there’s no answer just waiting for you. You create the answer, through a series of experiments. We all know someone who seems to understand this process naturally. They just go out into the world and figure it out. For some of us, though, this strategy doesn’t work so well. You know who you are. Maybe you’re an over-thinker. Someone who likes to consider many possibilities before acting on them. Maybe, sometimes, you get analysis paralysis. Analysis paralysis is what happens when you keep thinking and researching and gathering new information until you are so overwhelmed by options that you give up and do… nothing at all. Or maybe you’re a dive-straight-in-and-do-it type. You like to get your hands dirty, and you get frustrated trying to think things through first. Sometimes you find yourself on the wrong path, wondering how you got there. You sometimes wonder if you should plan out your actions a bit more instead. Or maybe you’re trying to keep up with life, and keep it all together. After all, there are a lot of things to take care of, especially if you’re responsible for other people. It can be hard to find time for yourself, let alone consider your goals, when you have a million things to do just to keep everything functioning. Or maybe you’re going with the flow of life. Feeling sort of aimless, unable to focus on anything, unable to find clarity and direction. Things just keep happening, and you go along with it. It seems like the more you stay passive and let life drift past you, the less it seems worth making an effort. Maybe it’s a little from column A; a little from column B. Either way, a structured approach can help you take a step back and assess things clearly. But there’s good news! It is possible to overcome your personal challenges to get you started on a path towards your best life. A life where you make choices. So no matter how things unfold, you know that you took them there, instead of letting life pass you by. Sometimes all you need is a little structure. The feeling of staring at a blank piece of paper can be overwhelming. The best way to start can be building from the ideas of others. Don’t worry! We’ve done some research for you. Follow the step-by-step process listed below, and hopefully this article helps you take the first steps along the way to the life you really want. A life where you do things that matter. So instead of sitting down and starting from scratch, why not follow along with these questions and get a little clarity? You might find that your life’s purpose comes into sharper focus. That’s the first step toward building a remarkable life – one you’ll feel proud of in years to come. Download your free printable worksheet and follow along. According to psychologist Steven Reiss, there are 16 basic desires behind people’s behaviour. While everybody is driven by all 16 desires to some extent, different people prioritise differently. According to survey data, at the core people’s motivations are driven mostly by genes. There’s a big difference in how much people enjoy different activities, such as eating and raising children. So much so that it can be hard for us to understand why someone else seems to love gardening so very much when we’re into building a business. These different levels of enjoyment lead to some very different life projects. Because of their genetic origin, they don’t change much during a person’s lifetime. Getting to know which of these really drives you is a great first step towards figuring out your life’s purpose. After all, before you know what, you have to know why. Okay, now you have a better idea of what really motivates you, this next step should be easy! The following questionnaire is inspired by career coach Rebecca Beaton. These 7 questions will help to build a picture of the life you want. Be as specific as you can. The more detail the better. What will you do with your mornings? What will do you for wellbeing? Will you have a family? Will you travel often? How will you grow as a person? What kinds of social events will you go to? What are your top 5 values? If you’re not sure where to start, this list of Fundamental Human Needs is a great jumping off point. Having already thought about your basic motivations, this is the natural next step and should hopefully come a little easier. “Everybody is a genius. But if you judge a fish by its ability to climb a tree, it will live its whole life believing that it is stupid.” This quote is often attributed to Albert Einstein. Whether he really said that or not, it’s hard to deny that it’s got some wisdom.Take this fun test to find out what your personal strengths really are. Or get someone else to take it on your behalf. You might be pleasantly surprised! List the skills you already have. Think about any past jobs you may have had, projects, extracurricular programs, hobbies, volunteer experience, or anything else relevant. Start writing down all the skills you can think of. That includes things like computer programs or technical skills, but it also means soft skills: things like teamwork, leadership, good listening, time management, etcetera. Now, make a list of the skills you want to have in the future. What activities give you a sense of meaning? What makes you come alive? What do all the things you enjoy, that feel meaningful, have in common? Often it’s the mental process behind the activity itself that matters, rather than the specific activity. For example, maybe you lose track of time while daydreaming of decorating imaginary houses. The process behind this is one of visual curation, bringing together separate elements to form a whole. The inner component of your purpose is focused on yourself and does not rely on outcomes. It’s a way of being, of doing. For example, you may want ‘to serve’, to ‘to create’, ‘to solve problems’. This one’s focused on the world around you. What change do you want to make to the world? Why? In what area do you want to leave the world a better place than you found it? How many related problems, challenges and opportunities can you think of? Take a breath, and open up to a new page, or a new note, or document. What problems, challenges, and opportunities exist in the areas you’re interested in? That follow from the mental processes you most enjoy? From the things you’d like to change in the world? Set a time for 2 minutes. Now write as many as you can. No filter. You’re allowed to write rubbish ideas down. The only rule is to keep writing. Once the timer’s done, it’s time to refine. Circle 3-5 of the best ones. You’ve come so far! Well done. We’re seriously proud of you. You made it through the questions. Maybe your head is buzzing with ideas and questions. Did you do it right? What if you messed some part of it up? The good news is that in these questions, there’s no perfect way or right answer. There’s only the answer that’s right for you. You get to decide. And if tomorrow you decide that you want to change it, guess what? That’s also up to you. Once you have some of these things written down, keep them in your Notes in your phone, or in your personal notebook, on a sticky note next to your computer – whatever floats your boat. You’ll see positive changes just from keeping your focus and your desires somewhere accessible. It’s navigating on the open seas: a lot easier when you can see the guiding star. Sign up for a course in jewellery making. Do a one month internship at a company. If it scares you, it’s probably a step in the right direction. The most powerful thing you can do, though, better than all those things put together, is to go out and conduct some informational interviews with people in relevant fields, doing amazing projects, or running businesses! What do they do, day-to-day? What do they wish they’d known when they started out? What’s the worst part of their role, project, or business? Now you’re armed with some self-knowledge, you’re in a great position to try things out and learn more about what suits you. As opposed to what you think you’ll enjoy, which – surprise – often turns out to be incorrect. Sometimes it helps to read about other peoples’ experiences. We’ve collected some Reddit stories from people who ended up doing something completely different to what they thought they’d do. So I looked up other eyelash artists & found this one lady who seemed legit, but I never got them done by her cause I just didn’t have enough money. I saw what company she was trained by & started doing my research on what it took to do eyelash extensions. Immediately, I quit my old job, went into beauty school, became an esthetician, trained with the same company that lady went, & got certified as a lash artist. At first, I didn’t have any clients & I worked at random salons until I saw that the same lady I found years ago was hiring because she was pregnant & needed someone to cover her clients. She had so many clients, she had to hire 3 girls to cover them all. Now I only work about 25 hours a week & I still earn well over $1k a week. We clicked so well & now she’s become a good friend to me instead of just my boss. She’s motivated me to expand my skills which I never would’ve even thought of if I hadn’t met her. I’m so grateful that I was lucky enough for my life to fall together this way. I love my job & I know it’s only gonna get better from here. Outta school had no clue what to do. 18 and dumb. All I had was a bike and backpack with the basics. I made it to middle of nowhere, WI where I met an elderly farmer looking for help, and I needed money. Currently 24, married to farmers daughter, and took over the farm. Make great money? Nope. Happy with where I’ve come? Hell yea! Even started a side job helpin other farmers in the area fix and maintain their equipment. After high school I just didn’t want to go to college yet. I had a semi decent food service job. My mom and dad told me they would help me pay for a trade school so I could at least have something extra. I did a 6 month course for dental assistant (it was the quickest and easiest looking one.) 10 years later I am still a dental assistant and absolutely love my job. I have been in the field so long I make an incredible amount of money for someone who went to school for 6 months. …after some periods of “oh no, I have no idea what I’m doing”. After college, I started making YouTube videos about random educational things that interest me and now I’m going for my PhD in Cognitive Psychology related to memory and learning from videos… I get paid to video edit now. Just keep trying new and weird stuff and you could find a deep passion. There are plenty more stories like these out there. They show that the path is not always clear from the beginning, and it doesn’t always follow a straight line. People tend to find their path through trial and error, through experimentation. And so can you. In the end, we’re here for a while. In that time, we do things. It’s up to you whether the things you do are important. Are they meaningful to you? Or do they just fill up time? Do you want to kill time? Or do you want to use your time for something important? There are some fantastic authors out there covering these topics in more depth. If you want more, I encourage you to read the following books. Tackle them any order that strikes your fancy! for a look at the big picture of humanity done in an engaging, easy-to-read style. You’ll never think of your place in history the same way again. a brilliant tour of the major ideas that have informed modern societies. If you’ve ever wondered how many of your ideas and convictions are your own, this is a captivating read. This superstar blogger and author cuts through the wishy-washy stuff and make you think about what really matters in life. If you hate self-help books, read this. This one is consistently recommended, across the internet, as a profound life-changing read. It’s dark. It’s heavy. And it will leave you with a new sense of gratitude and hope. Two Silicon Valley veterans teach you to take a design thinking approach to your life. This started out as a wildly popular course at Stanford University and evolved into a book. It helps to challenge so-called ‘meta-narratives’ of society, namely that you should have found your career path by 25, by using strategies and techniques used in top software and tech companies. Whether you’re finishing university, looking at a career change at 40, still studying, or going through a mini life crisis, it’s one of the most important questions you can ask yourself. And it’s not just a matter of ‘finding your passion’, as the career advice so often suggests. It could be worth going through these exercises once every few months. After all, we’re constantly changing, correcting course as we go. The most important things is to know that life didn’t make your decisions for you: you made them. Whatever you do, do it on purpose. Adele is a writer and designer. She began her career in commercial photography and video, before pivoting to a Bachelor's Degree in Literature and Philosophy. She's interested in all the ways we communicate and work together to share ideas and create brilliant new things.